Do you think that someone that lives in the Heights and works in the museum district is qualified to comment on the traffic problems on the Beltway 8 toll bridge? I don’t. If you live on the southeast side of Harris County, you’ll get a laugh out of the op-ed that the Houston Chronicle printed written by Ben Rose, a former Democratic Party candidate for State Rep. When the op-ed was first written, the entire theme was that County Judge Ed Emmett and Pct. 2 Commissioner Jack Morman were wasting taxpayer dollars replacing a perfectly good bridge that was, in the words of Mr. Rose, “a relative Mecca for traffic issues in Greater Houston – someone can virtually fly across it compared to the time it takes to drive through one of several other stretches of highway in the region.”. That should give you your first clue that Mr. Rose has no idea what he is talking about. The Beltway 8 toll bridge a Mecca for traffic issues? Good grief. I wouldn’t even have noticed this op-ed if the Chron’s Deputy Editor of the opinion pages hadn’t Tweeted that he wasn’t aware of the debate about this until Mr. Rose wrote about it. As I replied back, there is not a debate because there is no controversy. This project has been on the drawing board for years and is critical to the future of the east side and the economy of the Greater Houston area. Mr. Rose seems to know nothing about either. More important is that Mr. Rose didn’t know that this was a toll bridge and that no taxpayer funds were being used. And seemingly no one on the Houston Chronicle editorial/opinion staff knew this before publishing Mr. Rose’s op-ed. After this fact was pointed out, he or someone on the Chron staff changed it to complain that toll revenue could not be used on projects unrelated to toll roads. Their solution? That Judge Emmett and Commissioner Morman should lobby the legislature to change the law so that toll revenue could be used to fund projects completely unrelated to tolls. Or even worse, that the county should ignore the law and use toll revenue on unrelated projects until the Texas Supreme Court stopped them. I suppose we’d better get used to these types of editorials, columns and op-eds increasing in frequency prior to the November elections. That Houston Chronicle and it’s editorial board and opinion columnists have much invested in seeing a “blue wave” hit Harris County in a non-presidential year. If it doesn’t happen, they can say that at least they tried and those dumb voters struck again. As for the replacement of the Beltway 8 toll bridge itself, like I said earlier it is much needed, is critical to the future of the east side and it has been on the drawing boards for years. Click here to read an unbiased news report from Houston Public Media. Torres said thecable-stayed designallows for deep foundations to accommodate soil conditions. And since there won’t be pylons in the middle of the water the Ship Channel will beeasier to dredge. If Mr. Rose had any familiarity at all with the Beltway 8 toll bridge or the east side of Harris County, he would have known this. But hey, partisan politics, right? You know, the type of politics that the Houston Chronicle editorial board screams about constantly? Sheesh. Hopefully Mr. Rose and the Chron opinion folks will read the news portion of the newspaper before committing to these kinds of partisan attacks in the future. I always wondered why the tunnel had to be destroyed once the bridge was built. It seems like, in a situation where there’s trouble on the bridge, or in the event of a massive evacuation from a hurricane, having an alternate method of crossing the ship channel would come in handy, especially an alternative that is already built and paid for, ongoing maintenance costs not withstanding. Wrong bridge, Bill. The Baytown Tunnel was removed after the Hartman bridge was built because it prevented the ship channel from being dredged deeper than 40 feet. Once removed, the channel was deepened to 45 feet and widened to 530 feet. Ah, I plead brain fog. You are right, of course. Thanks for the save. Tolls from the system not just the bridge will pay this. Big difference. 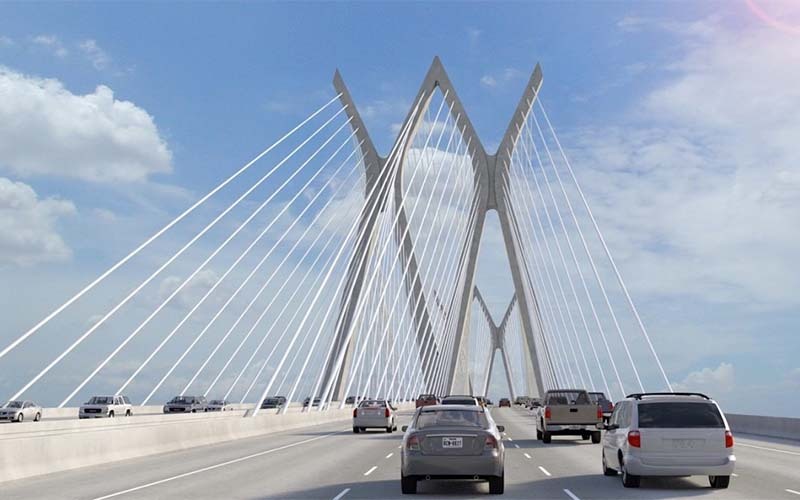 So, instead of the bridge paying for itself, which I am fairly certain it never would, our County Commissioners decided to keep high toll fares on all our other toll roads high so that they could vote to build this monument. Thus, turning the toll roads and HCTRA into just another form of taxation and wealth redistribution. Each toll road and toll bridge should stand on its own financial feet. Here, you have the rest of us in Harris County paying artificially high tolls so that all the extra income can be siphoned off to fund something that is otherwise a financial black hole. I don’t think that you are correct but you do have a valid point. At the current rate of 55k+ vehicles a day, revenue at the min would be $40m/yr. So currently, the bridge is supporting other projects and maintenance. I haven’t seen the amortization schedule but with the increased traffic, I suspect it will also produce positive revenue to help maintain older parts of the Beltway that are not tolled. But, like I said, I’m not certain. Untolled parts of the Beltway (such as between 45 and IAH) are actually owned and maintained by the State of Texas. You will notice a very small sign that says, “End of HCTRA Maintenance” or something like that. IIRC the original concept of the toll roads were to have them become free as the segments were paid for. The commissioners changed that into the west side of town that was paid for in record time subsidizing the remaining segments. The West Loop, Sam Houston on the west and Grand Parkway on the west are all identically congested in the corridor between Westheimer to Longpoint/Longenbaugh. I also recall the current bridge was intended as only half of the final configuration. It is the newest bridge crossing the ship channel. I wonder why it is being removed instead of doubled. The current bridge has pylons in the water. The new one will not, which makes dredging the Ship Channel simpler and safer. I sure hate to see anything torn down and for such a little bit of gain. What 5 feet more in depth ? will the ship channel even with its fees pay that destruction off in the next ten years? 5 feet of depth makes a huge difference in the size of ships that can use the Ship Channel. However, the more important feature of the new bridge is widening the distance between the pylons that support the bridge. The current bridge has two large pylons in the Ship Channel. The new bridge will not have any structure in the channel at all, allowing for widening, and eliminating the potential for ships to hit the bridge.